The All-Party Parliamentary Group (APPG) on General Aviation attended the official announcement of the appointment of Byron Davies, the founding Chair of this group, to the role of General Aviation Champion at the Department for Transport. 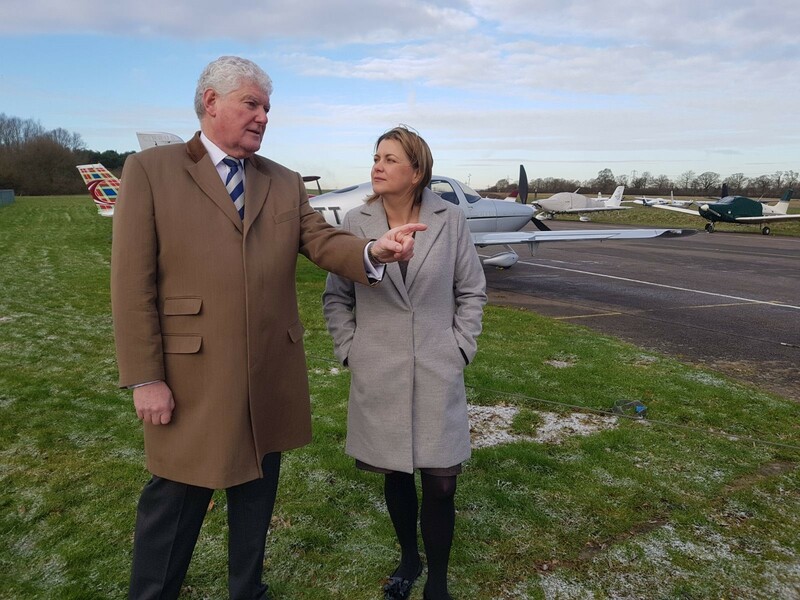 The announcement was made by the Aviation Minister Baroness Sugg at Elstree Aerodrome, in a clear sign that the Government is taking the concerns of the All-Party Group and the sector at large seriously. General Aviation is a key driver of economic growth, contributing £3bn directly to the UK economy and supporting 38,000 high skilled, high-tech jobs in science, technology, engineering and mathematics (STEM). A roundtable discussion followed the announcement, involving Byron, the Minister and key representatives of the General Aviation community. Baroness Sugg had high praise for the sector and agreed with Grant Shapps MP, Chair of the All-Party Group, that airfields need greater protection from development. The Minister was also receptive to suggestions from the panel regarding reforms to airspace and taxation arrangements. Commenting on Byron’s appointment, Baroness Sugg said: “Smaller airfields and the pilots who use them contribute £3 billion to our economy and support more than 38,000 jobs, be that through business jet operations, flying schools or leisure flying. As well as being a voice for General Aviation inside Government, Byron will also work alongside specialist consultants York Aviation in shaping the forthcoming General Aviation Review. The review aims to identify a strategic network of airfields which are of key national importance and should be protected from closure. Grant Shapps MP, Chair of the all-party group, said: “I strongly welcome Byron’s appointment to the Department for Transport as their first ever General Aviation Champion. This is a very welcome and timely announcement, and proves that Government is finally getting the message that General Aviation can no longer be ignored. Byron Davies is the founding Chair of the All-Party Parliamentary Group and held the role until the last election, following which Grant Shapps MP was elected as Chair. Since then the parliamentary group has grown enormously, and now contains a record 132 Parliamentarians from across all the major political parties and both Houses of Parliament.